Supersprint's muffler system for the R50 Mini Cooper delivers sound that rips a bit more, is throatier, and with more rumble than a stock exhaust. But is still mild mannered and civilized for around town stop and go. It's a perfect complement to any R50 Mini Cooper. Supersprint exhaust is widely recognized as the leader in complete exhaust system upgrades - extremely high quality, well designed for optimal flow, and amazing sound. Even at a premium price Supersprint is an unbeatable exhaust system because every aspect is done to such a high level. 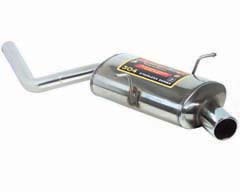 A Supersprint exhaust rewards you with a terrific sound, long lasting construction and excellent fitment. The Supersprint sound is very 'European' which fits the sporting sophistication of Minis perfectly. Most systems are also modular - sections can be added or removed to custom tailor the exhaust sound to your preferance. Aside from 'Race' systems, their mufflers meet European noise laws so you get a refined and tuned sound without being excessively loud. Most Supersprint systems are built with larger diameter piping to improve exhaust flow which helps the engine do less work and make more horsepower! Supersprint exhausts generally run at a premium over other systems but no other system on the market can match their quality, performance, or reputation! Questions about a Supersprint Exhaust for your Mini? Need an installer you can trust? Talk to the Mod Experts - Call us at 714-582-3330.